Put Those Shoes On: Running Won't Kill Your Knees Contrary to popular belief, running isn't damaging to your knees. In fact, a light running regimen may actually strengthen healthy knees. But researchers say if you've just had knee surgery or if you're overweight, don't suddenly jump right into an intensive running program. Yes, it's true: Jogging, long thought to hurt knees with all that pounding and rattling around, may actually be beneficial for the complex and critical joint. There are caveats, though, especially for people who have suffered significant knee injury or are overweight. But for the most part, researchers say, jogging for your health seems like a good idea. David Felson, a researcher and epidemiologist at Boston University School of Medicine, says past concern about jogging and knees centered on the continuous impact of the foot to the ground and suggestion that it caused degeneration of the knee and the onset of osteoarthritis. But when researchers actually studied the impact of running on knees, he says, that's not what they found. "We know from many long-term studies that running doesn't appear to cause much damage to the knees," he says. "When we look at people with knee arthritis, we don't find much of a previous history of running, and when we look at runners and follow them over time, we don't find that their risk of developing osteoarthritis is any more than expected." Both types of studies agree, says Felson, that recreational running doesn't increase the risk of arthritis. In one study, Swedish researchers found that exercise, including jogging, may even be beneficial. Felson describes how researchers took one group of people at risk of osteoarthritis and had them engage in exercise, including jogging. The other group didn't exercise. After imaging the joints of the participants in both study groups, they found that the biochemistry of cartilage actually appeared to improve in those participants who were running. Felson says that suggests that "running is actually healthy for the joint." Long-term studies show that running doesn't appear to damage knees. But researchers caution that if you've had knee surgery or if you're more than 20 pounds overweight, you shouldn't jump right into an intensive running routine. But, according to Lane, "if you have a relatively normal knee and you're jogging five to six times a week at a moderate pace, then there's every reason to believe that your joints will remain healthy." That's great news for Paul and Lyra Rider, avid joggers who live in the Hollywood Hills in Los Angeles. Jogging on Mulholland Drive, they say, offers fantastic views — along with a relatively flat route. 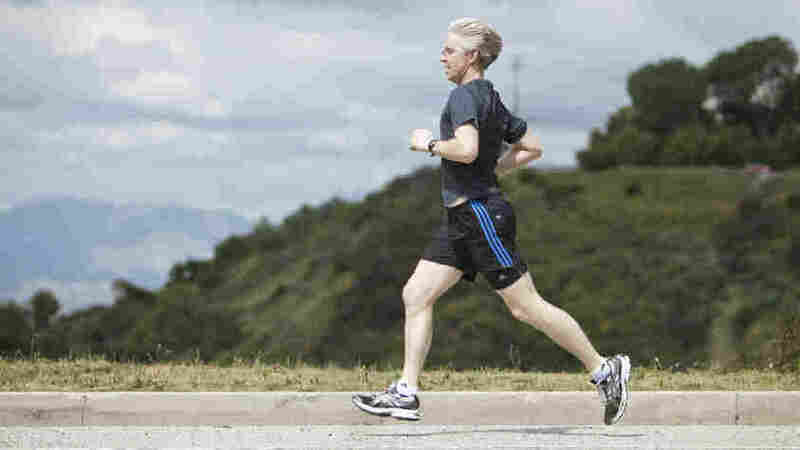 Paul, 46, jogs a seven- to eight-minute mile — not as fast as his younger days. Lyra jogs a bit slower. She enjoys the exercise, health benefits and simplicity of jogging. "You don't need lots of fancy equipment, and you just feel great when you're done," she says. Lane did some of the very first studies of runners and knees while she was a resident at Stanford University. "We wanted to answer the important question of whether, if you continued to run into your 50s and 60s and even 70s, you also ran the risk of damaging the knees," she says. The answer, she says: absolutely not. And there was an extra bonus: While enthusiasm for jogging seemed to diminish as people hit their mid-60s, Lane says they were still more inclined than the non-joggers to get out and exercise. "They were active doing other activities, like walking, yoga, water aerobics," she says. "We found that as these people aged, not only did they feel better about themselves, but their quality of life was better and they tended to actually live longer" than the non-joggers. So, the message for joggers like the Riders, who hope to be jogging all their lives, is a hearty two thumbs up. Lane cautions that if you have suffered a knee injury, especially one that required surgery, running can actually increase your risk of knee arthritis. So can routinely running really fast — at a five- or six-minute-mile pace — or running in a marathon. Lane's best advice? 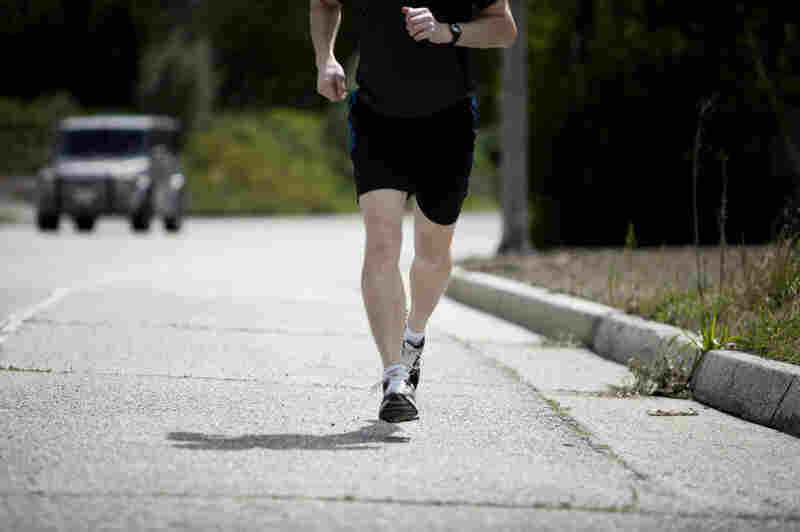 Running in moderation, at an eight- to 10-minute mile pace, for about 40 minutes a day. But if people are more than 20 pounds overweight, Lane says they shouldn't start off with an intense running regimen. "I have them walk and walk until they're to a point where I think their body mass is reduced enough that it won't traumatize their joints," she says. Otherwise, significantly overweight joggers run the risk of that extra weight stressing the knee to the point of inflammation, the formation of bony spurs and accelerated cartilage loss.